Crazy things you see on the road. Hey Bob, can you get any closer to this truck? Bob doesn’t realize how close he gets to other cars. Some people would call it tailgating. Bob however, insists that he is at least 10 car lengths away. Really? Then why can I see the termites on that wood! All those logs are held down by a pieces of string and I saw that scary movies Final Destination. 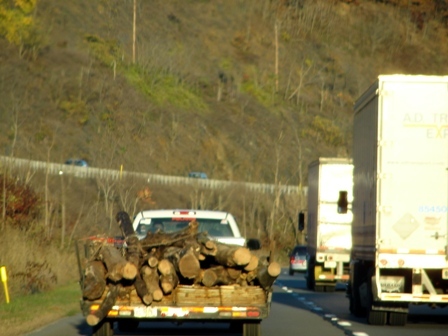 Ok, I didn’t see the movie, just the preview where they showed the part where the wood comes flying off the truck and right into the windshield. Ouch. So now I just say to Bob. The face! I then make a Madonna vogue like dance move with my hands outlining my face and say ” not so close” we need to save the face. I’ll let you know how this works out. We were close to this guy but I made bob pass him cause I was like, “Hey are those legs sticking up out of that truck bed?” Yes, indeed they were. 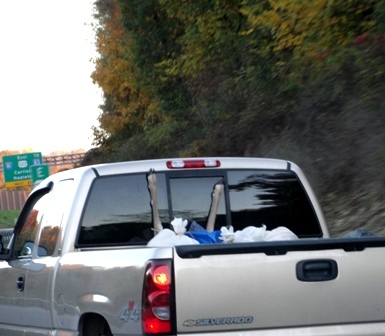 Now why would you put your dead deer in the truck with the legs sticking up so everyone could see. I sure hope it is hunting season. Poor Bambi! We are in the middle of Pennsylvania. 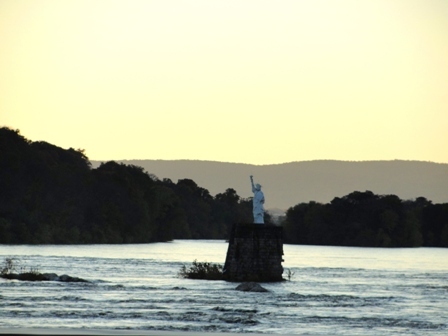 I have no idea why Lady Liberty is hanging out here. Maybe she is on vacation, maybe this is her sister or maybe just maybe our Lady has a ‘minny me’ statue. Ok. I looked it up and here is the scoop on this lady. You never know what you can learn and see while driving around.